Windows Phone had its day in the sun yesterday. After discarding its previous seven-year effort with Windows Mobile, Microsoft started with a clean sheet of paper. However, whereas the software has been re-built, the business model has not. WP is still a licensed operating system whose primary customers are mobile phone vendors. With Symbian mostly out of the picture, WP becomes only the second viable commercially licensed mobile OS, after Android. So with two licensed platforms in the running, how do we measure success in the licensing business? Units sold to end users is one metric. But that data will have to include the performance of vendors and operators and other distributors. And it will take a year to do valid comparisons. The only indicative metric we have available today is how many devices have been committed by vendors. As WP is out of the gate with device announcements, we can actually measure this. We can plot each vendor’s commitment to various platforms as an early indicator of strategic success. To that end, here’s the methodology: I took all smartphone vendors and tallied how many SKUs they have announced or leaked for either the WP or Android platforms (source: pdadb.net). I then plotted each vendor on two “commitment axes” (see notes below). The more to the right a vendor lies, the more committed they are to Microsoft’s platform. 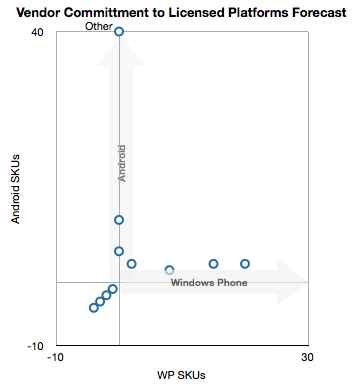 The more to the top a vendor lies in the chart, the more committed they are to Google’s platform. The vendors which don’t have any licensed products lie below the origin. What we can observe is that Microsoft has pulled several, though not all vendors partially to its side. The level of commitment is not yet very high and it has not likely reduced their commitment to Android. In other words, points are moving to the right but not (yet) down. Is Microsoft’s re-entry going to peel vendors away from Android. In other words, will points move down as well as to the right. Is there motivation for some vendors to move to their own platforms like the non-committed? We’ve shown that profits accrue disproportionately to the vendors below the origin. As a result, is the pool of available top tier vendors going to shrink? Will vendors commit to single platforms or maintain this split OS loyalty strategy? Will we see LG migrate to WP exclusive and will Others remain exclusive in Android? Microsoft’s strategy is aimed at top tier vendors more than to the “others”. This is due to a lesson they learned with Windows Mobile: having a ton of SKUs does not guarantee a healthy ecosystem (a lesson that Android has not acknowledged as true). There are positive and negative consequences. The positive is that Microsoft control the experience better, create a better brand and can participate in an effective dialogue with operators. The negative is that they are going to deal with a diminished licensee pool. On the second question my prediction is that vendors are going to move “down and to the left” away from the licensing model. If they can’t go direct to that quadrant, vendors will consolidate portfolios around one licensed platform. The distribution of commitment I forecast will look like this: Maintaining multiple platform development teams is expensive. Branding is also confused. The upside is that you get to play the operator’s divide-and-conquer game of platform dilution (aimed at the non-licensing players in the lower left corner). In particular, Samsung, with Bada, is likely to find ways out of license-land. Sony Ericsson may stick with Android and LG may move to Windows exclusively. That really leaves only HTC and Dell as licensees with multiple licenses. This axial alignment is not a healthy thing if you are a platform vendor. Having one or two dedicated customers means the power of the buyer is much higher and their wishes become your command. Which leaves only one true prize in the game: the “others”. 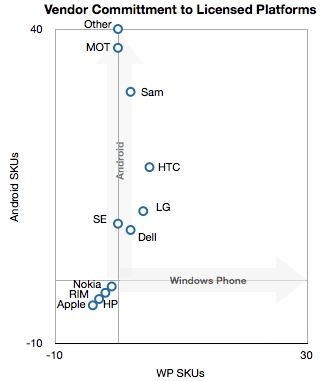 Android is clearly the darling of “Others” who are being shunned by Microsoft. Can “Others” become the lever for Google to pry open the market? History and the tangled web that is operator distribution does not point in that direction. ‹ Previous Post What did Andy Rubin mean by saying WP7 was created for political reasons?